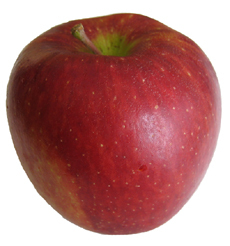 The domesticated apple is economically the second most valuable fruit grown in the United States, second only to the orange (Wolford & Drusilla, 2007). Pollan (2001), points out that Ralph Waldo Emerson once called the apple the “America Fruit” (p. 6). 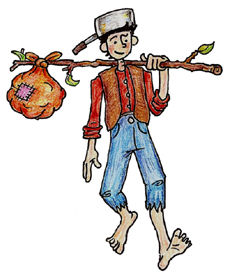 Johnny Appleseed, the “Big Apple”, “as American as apple pie”. The apple certainly has made itself at home in America. What are the true origins of the domestic apple? Flowering plants made their first appearance in the fossil record during the Cretaceous (Kenrick & Davis 2004, p. 195). 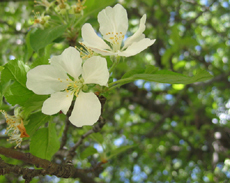 The genus Malus most likely arose in the Tertiary environments of what is now Southern China. 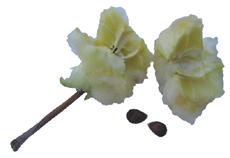 Early Malus species bore small fruits whose seeds were dispersed by birds. Large herbivores, such as the horse and bear, may have been involved in the early evolution and dispersal of the sweet apple. The proper scientific name for domesticated cultivars and wild varieties of the sweet apple is Malus pumila (Juniper and Mabberley 2006, p. 18). Today mixed fruit forests with wild M. pumila can be found in central and inner Asia. Natural fruit forests containing 80% M. pumila still exist in the Tian Shan Mountains. As awareness and concern about our monocultural practices spread, there is a growing interest in protecting the genetic diversity that can be found in these natural settings (Browning 1998, p. 34). It was once thought that the present day apple was the result of hybridization and human selection. Evidence now suggests that the evolution of M. pumila was shaped by the Tertiary geography, climate and ecology of what is now Southern China (Juniper & Mabberley 2006, p.17). The most up-to-date account can be found in Juniper and Mabberley’s The Story of the Apple. The book is not only well researched; it is a delight to read. Once M. pumila had evolved to its present form, how did humans affect its success? Humans spread M. pumila from China, to Rome, to Northern Europe through commerce and conquest. Apple trees were spread intentionally through the grafting of trees to create orchards and unintentionally via the consumption of apples and the subsequent dispersal of seeds. In order to germinate apple seeds need to be separated from the core tissue, which has inhibitors to germination and be subject to extended periods of near freezing temperatures. The need for 60 or more near freezing days before germination is most likely an adaptation to the climates of Southern China. As the sweet apple spread west it encountered new environments with different selective pressures. Sexual reproduction via the production of seeds most certainly produced M. pumila varieties better suited to their new environments. European settlers brought M. pumila to the Americas. Many of the European grafted cultivars did not fair well (Pollen, 2001 p. 12). M. pumila more than any other apple species exhibits incredible variation in the form of its growth, leaves, and fruit. Each seed is a unique genetic combination. When this incredible variation is unleashed through planting from seed it is inevitable that M. pumila will adapt to its surroundings. North America became a great experimental station for the sweet apple; through variation combined with both natural and artificial selection the apple found a new home. The apple quickly became an important food source. Pollen (2001) speculates that for early American colonists apples were the main source of sweetness as sugar and honey were not widely available (p.17). Dried apples retain their nutritional value and can be easily stored. Dried apples were not only an important winter staple; they became a valuable export. Apple evolution was influenced by humans need for food; however, it was really accelerated by the need for liquid. John Chapman (1774-1845), often referred to as Johnny Appleseed, helped make North America a testing ground for seedling selection by establishing apple orchards. Chapman sold his trees mostly to pioneers settling in areas up and down the Ohio River Valley which includes the present day states of: Ohio, Indiana, Illinois, West Virginia, Pennsylvania, and Kentucky. Chapman’s seedlings were only good in complying with land grant requirements for planting fruit trees or growing apples for cider production (Pollen, 2001 pp.15-23). Hard and soft cider was a critical beverage for Europeans and early American colonists. Unpasteurized cider not only provides vitamin C, the fermentation process creates vitamin B12. The alcohol and tannins in cider stop bacterial growth, making it all the more important when water sources are unreliable. Human cider production requires only the random apple trees produced from seed. Seeds survive the production process, a fact of which Chapman took advantage. Humans most certainly accelerated apple evolution though cider production because at a local level it encouraged the growth of apple trees from seed (Juniper & Mabberley, 2006 p. 161). Although humans have played a hand in sweet apple evolution Malus pumila remains wild and genetically very similar to its wild form (Juniper & Mabberley, 2006 p. 183). Unlike cultivars that depend upon humans for survival like corn, seedless oranges, banana, etc., the apple retains its ability to create great variation though sexual reproduction. 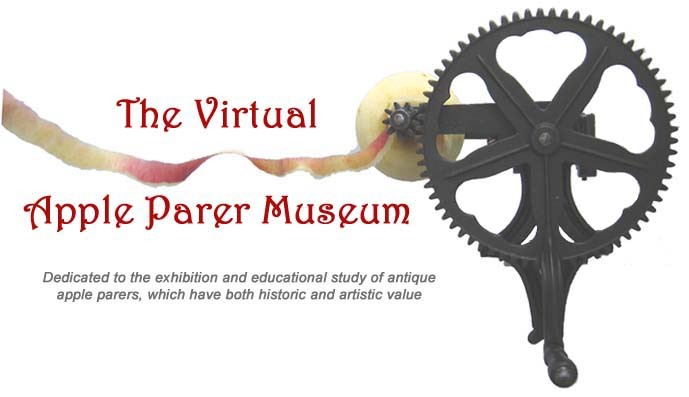 You can explore fascinating connections between the evolution of American apple orchards and the development of apple parers by reading Appeal to American Apple Parers: Historical Perspectives on Orchards and Yankee Ingenuity published in the Autumn 2016 issue of The Midwest Quarterly.